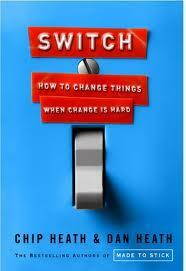 I just finished reading Switch, a book about how to effect change. Very Dale Carnegiean, the substance of the book was nothing revolutionary, per se. But I liked the way the Heath brothers broke things down to the Rider and the Elephant (borrowed from The Happiness Hypothesis). Here are a few of my favorite pointers from Switch. Follow the Bright Spots - Pretty obvious but often neglected. Find out what is working and seek to replicate it. In the book there's a great story about a man who successfully fought child malnutrition in Vietnam using this method. Script the Critical Moves - Similar to a S.M.A.R.T. goal, this means just taking great care to specify and record steps to achieving a goal in manageable, exact behaviors. Shrink the Change - Make the task appear smaller and manageable. For example, issuing a rewards card with two of ten spaces stamped will generate more repeat business than an empty card with only eight spaces. Overall, this was a very helpful book and I would recommend it to anyone (and don't forget to read Made to Stick, by the same authors! ).